At every moment we are connected to consumers and anticipating regional and global movements. We always go to the root of preferences, desires and particularities that is the eating and drinking experience, bringing it scents that send the best of life’s flavors. The combination of consumer trends, market evaluations, technology and the art of developing aromas results in special projects called Collections. These projects demand intense research and sensory tests until creating the most synergetic groupings of flavors that generate unique, characteristic and innovative portfolios. With Collections, Duas Rodas makes it possible to constantly reinvent the food and drink industry and give final consumers new experiences every day. Try them out! Click on the collections below to learn more. Famous for the spiciness factor, peppers are part of global gastronomical culture and are winning more fans every day in the consumer world. The Pepper Collection goes beyond this vision, not only highlighting aromas that explore the most acclaimed attribute of these spices, but also the entire flavor load that each one contains. The portfolio covers the following aromas: pink peppercorn, allspice, Capsicum baccatum, jalapeño, chipotle, malagueta pepper, habanero, sriracha, green and red pepper sauce. A world of flavors makes up this portfolio. Inspired by fruit, desserts, spices and coffees, the Lipo-soluble Collection counts on perfect aromatic intensity and fidelity for inclusion in different food/drink items that have a lipo base. A mixture of positive sensations that add value to products throughout the world. Get to know the portfolio: Tiramisu, Brigadeiro, Coconut, Nuts, Cherry, Red Fruits, Creme Brulèe, Hazelnut, Strawberry, Lemon Pie, Pão de Mel (Honey bread), Dulce de Leche, Tutti-Frutti, Caramel, Truffles, Orange, Pepper, Cappuccino and Mint. The wide variety of citric fruits throughout the world and their particularities are explored. With 12 profiles, with clean notes that are faithful to these fruits at their best stages of maturity, the portfolio covers the aromas of Lemon, Bitter Orange, Blood Orange, Citrus Deliciosa, Persian Lime, Laranja Baía (Baía Orange), Ponkan, Palestinian Sweet Lime, Rangpur, Laranja Lima (Lime Orange), Tangerine. The global passion for chocolate also has its preferences. We deeply studied cocoa and its most precious derivatives, identifying the different nuances that make up its delicious flavors. Our Collection brings together 9 chocolate flavor profiles, which add sensoriality to the food and drink industry and delight final consumers more every day. These are Bitter Chocolate, Belgium Chocolate, Hazelnut Chocolate, Coffee Chocolate, Milk Chocolate, Malt Chocolate, Toffee Chocolate, Truffle Chocolate and White Chocolate. Our inspiration comes from nature, saving the best nutrients in tropical fruits and offering additional benefits to the food, drink and supplement industry with the Fruittion line. It concentrates development efforts and appropriate technologies in order to save the best attributes of each fruit, stabilizing natural assets and preserving their chemical characteristics. The Fruittion line is made up of standardized Acerola with natural Vitamin C, Açaí with a high concentration of anti-oxidants, Guaraná with natural caffeine and Mate Verde (Green Tea), a Brazilian herb with anti-oxidants. Reducing the population's sodium consumption has been high on the list of public health priorities throughout the world. 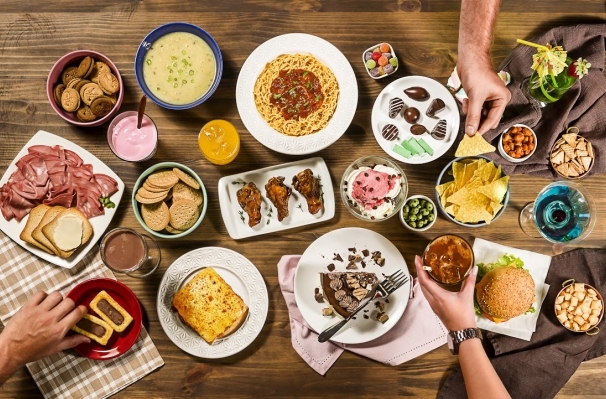 The growing search for "healthy and salty" foods has opened new horizons for the industry, challenging it to keep the same sensorial qualities of products while considering a reduction of sodium. Based on this, we developed NALESS, a food formula for salty foods, especially created for adding to processed food that need a clean salty flavor without the addition of a high concentration of sodium. This product gives food taste characteristics that add the same flavor sensation as traditional salt. In the Vanilla Collection, deep studies unblocked the complex profiles of vanillas, giving the food industry aromas and extracts that allow products with their own identities to be created, within the innovative flavor cycle, which better connects to consumed products and preferences. Red Connection preserves the nuances naturally found in the world of red fruit, by using striking flavors, intense scents, balanced acidity, all which promote faithful and authentic notes of each of the fruits that inspire the portfolio. Flavors present in the Collection are: Red Fruits, Guava, Apple, Raspberry, Strawberry, Cherry and Watermelon. The authenticity of true cheese depends on its type, maturity, seasoning, composition, perfect eyelets, among other aspects. This was how the Cheese Experience collection was developed; we isolated molecules that give each variety its impact and flavor, developing exclusive biological bases and combined aromatic compounds in order to accurately reproduce the desired profile. The portfolio is made up of: Camembert, Gruyèr, Gorgonzola, Parmesan and Provolone.